Having just returned from a short stay in the stunning Swiss town of Lauterbrunnen, I’m a bit of a drooly, overwhelmed mess. 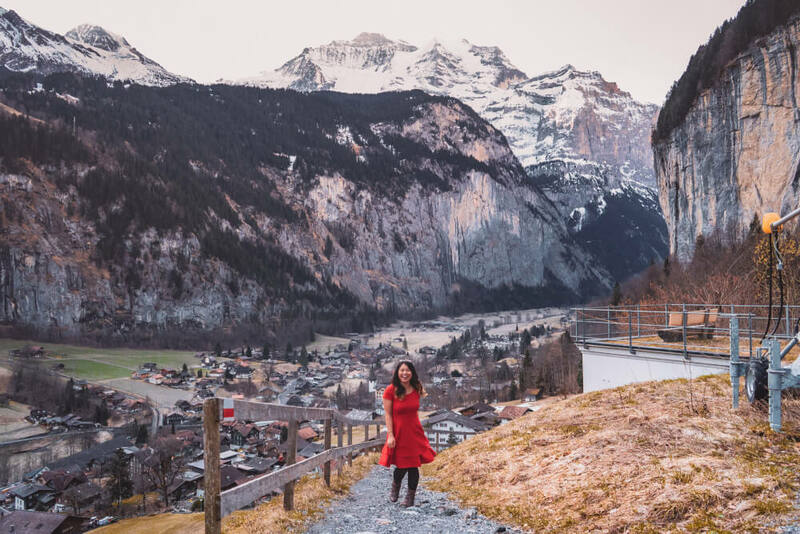 After all, with a head full of dreams carefully planted from years of pining over Lauterbrunnen on Instagram and Pinterest, my expectations were so high I could practically vomit from excitement. The issue? Many of the photos circulating online are actually snapped from drones, which means they’re not real views you can access without spontaneously sprouting wings. So, if you’re like me and have failed at sprouting said wings, I’ve done some groundwork for you! Here are some of my favourite viewpoints that I discovered (and how to reach them!). Best of all? Most of them are very easy to reach, with minimal hiking required. I apologize that these viewpoints don’t have official names, and that street names don’t really help in this tiny town, but hopefully my painfully detailed directions won’t lead you astray! NOTE: This post reflects my experiences from March 2019. I apologize in advance if the names of certain businesses change, but if you have any trouble finding these viewpoints, just pop into the Tourist Information Center with my photos and they’ll be able to help you out! 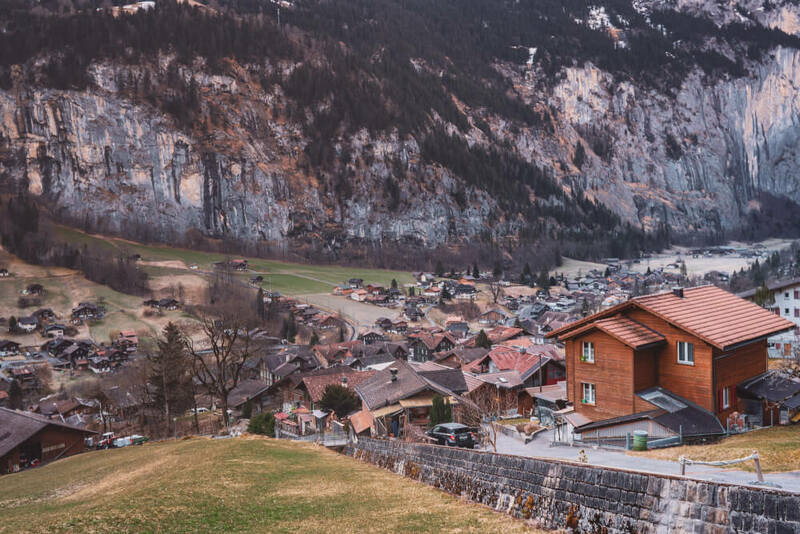 Who’s ready for a scenic tour through this magical Swiss town? Whether you want to walk a lot or just a little, here are my top picks for amazing (mostly free!) viewpoints in Lauterbrunnen, Switzerland. 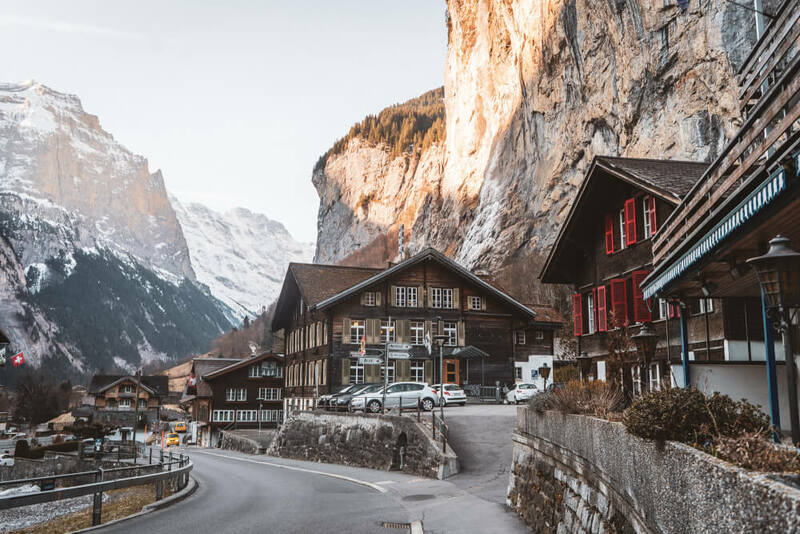 Seeing a photo of this spot many years ago was one of the reasons I decided to visit Lauterbrunnen in the first place. I mean, the magical spray of Staubbach Falls to the right, the iconic local church to the left… I knew that seeing this picturesque spot for myself was priority #1 when I arrived in Lauterbrunnen, so when (after hours of searching), I still hadn’t found it, I was ready to rage-eat some potatoes. … BUT after a quick inquiry at the local tourist office (a wonderful resource by the way!) I discovered this viewpoint is the easiest little walk ever… because it’s actually downhill from the main street. How to reach this Lauterbrunnen viewpoint: Starting from the Lauterbrunnen Tourist Info Center (Stutzli 460), walk in the direction of the Staubbach Falls (away from the Train Station) for about 150m until you reach the Airtime Internetcafe. Directly across from the Airtime Internetcafe, you’ll see an Electric Shop (EWL Genossenschaft) which has two funny stone spheres made up of tiny stones in front of it. There will be a little path that goes left from here which will bring you downhill to Chalet Pironnet. Directly in front of Chalet Pironnet is this viewpoint! While most people don’t usually hike from Lauterbrunnen up to Mürren (the recommended route is actually to take the cable car up and then hike down since it’s so steep! ), I let my curiosity get the best of me and decided to walk the first portion of this trail to get a good view over the valley. It was quite steep, but in less than 20 minutes, I was able to find the most amazing views ever over the Lauterbrunnen Valley, so if you don’t mind a little huffing and puffing, I highly recommend doing this mini-hike for an amazing perspective over Lauterbrunnen! How to reach this Lauterbrunnen viewpoint: There are a lot of bright yellow signs in Lauterbrunnen that point you towards a variety of hikes. To get to this viewpoint, simply find a yellow arrow sign that says “Mürren” and follow it uphill. I turned uphill from the main street somewhere around Hotel Oberland. Again, this is a very steep mini-hike but you’ll be rewarded in less than 20 minutes with a stunning view over town. 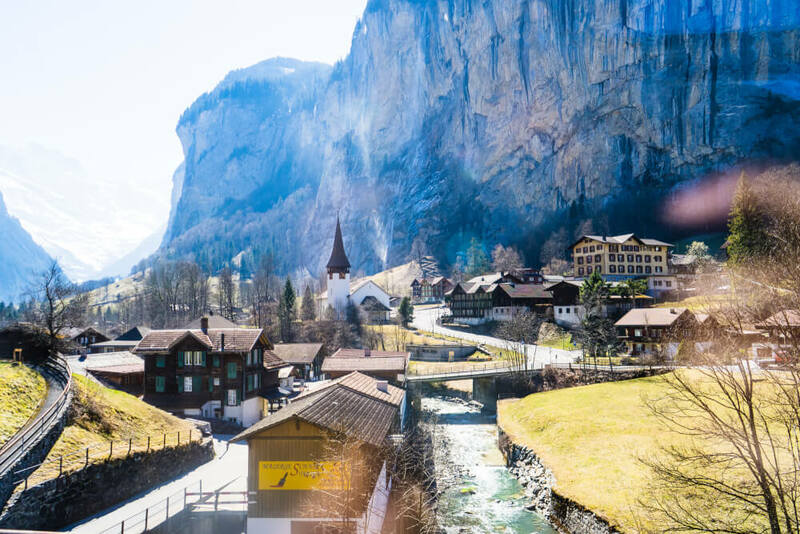 If you take the relatively flat and easy hike from Lauterbrunnen to Stechelberg, you’ll be entertained with beautiful views all throughout your trek. 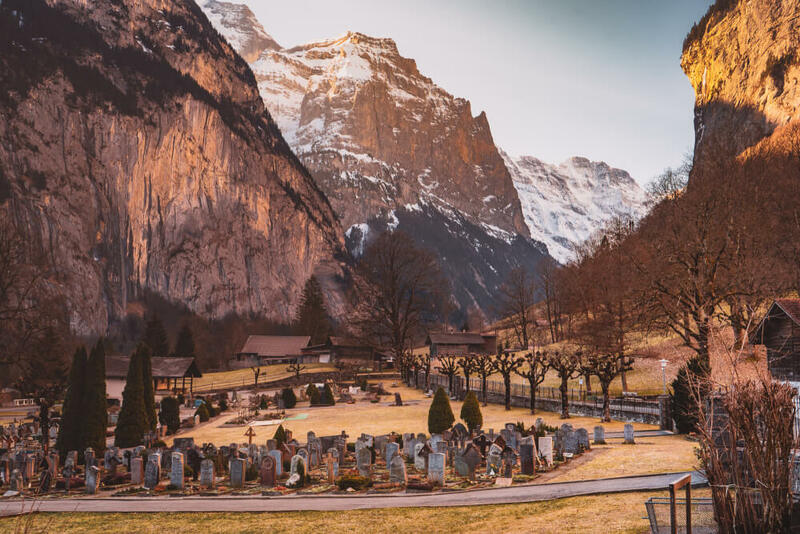 If you don’t have time to do a full hike though, the short walk down Lauterbrunnen’s main street over to the Lauterbrunnen Friedhof (Cemetery) offers a stunning vantage point of the valley and the city too. How to reach this Lauterbrunnen viewpoint: Starting from the Lauterbrunnen Tourist Info Center (Stutzli 460), walk in the direction of Staubbach Falls (away from the Train Station) and follow the path straight until you hit the Friedhof Lauterbrunnen. You’ll start to see the gravestones on your left. If you reach the Camping Jungfrau Holiday Park, you’ve gone too far, but just turn around and enjoy the view! 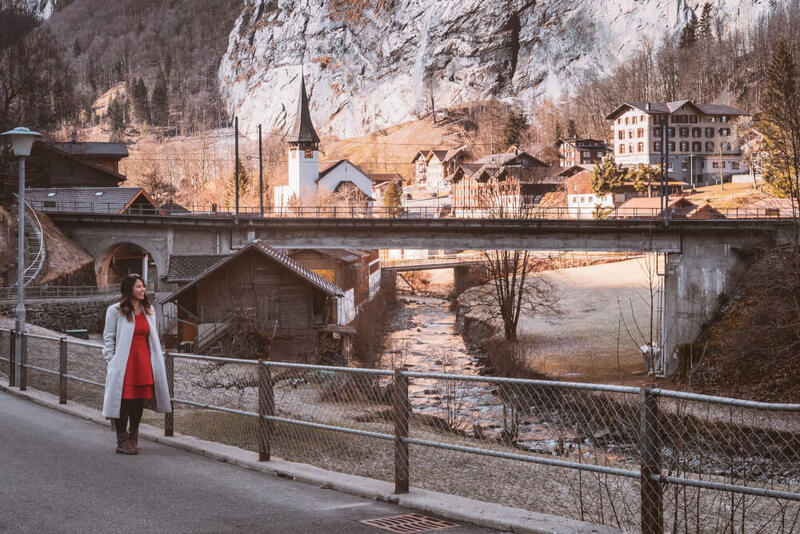 Most visitors to Lauterbrunnen stay on the right side of the river (where the Staubbach Falls are) but some great perspectives can be enjoyed from the other side too! One of my favourite viewpoints in Lauterbrunnen was this simple one of the church and river in front of it. You’ll find it close to the town’s high school. How to reach this Lauterbrunnen viewpoint: Starting from the Lauterbrunnen Train Station, do NOT follow the signs that point you to the “City”. Instead, turn around and head towards the exit where the big multi-story parking lot is. Exiting the train station, turn right and follow this path until you see a foothpath/bridge to your left that leads you over the river. Once across the bridge, turn right and follow the path town. You’ll pass by the Lauterbrunnen Sekundarschule (high school). Keep walking down this path and you’ll eventually reach this beautiful viewpoint! Wengen is a pretty town perched above Lauterbrunnen, which means inevitably it has some excellent views of the Lauterbrunnen Valley to offer. My personal favourite is the view from Saint Bernard’s Church (which is listed on Google Maps as the Evangelisch reformierte Kirche Wengen). On a clear day, it offers impossibly stunning views of Lauterbrunnen below and even the Staubbach Falls! 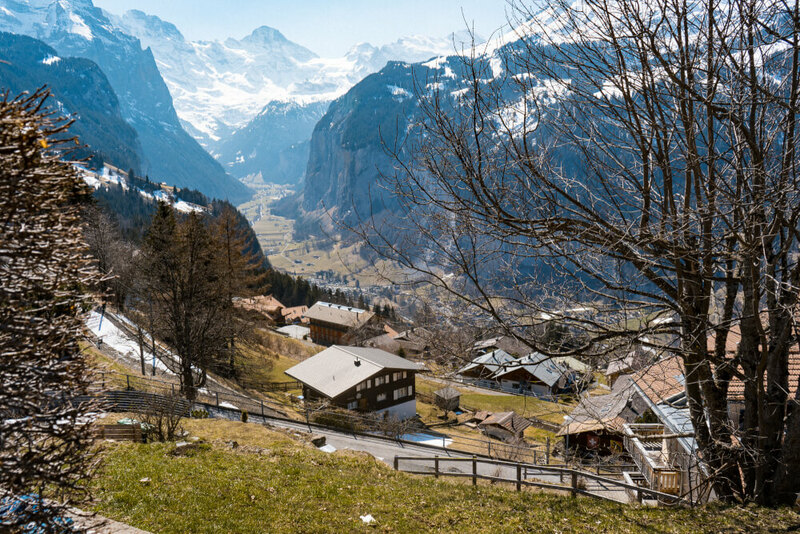 How to reach this Lauterbrunnen viewpoint: Take the train from Lauterbrunnen to Wengen. Leaving the Wengen train station, take a left and walk down this main street (Dorfstrasse). You’ll pass the Tourist Information Center to your right, and then several restaurants, bars and hotels as you continue down Dorfstrasse. Keep your eyes to the left side because in about five minutes, you’ll see a church to your left. Follow the path and climb up to get right next to the church. Directly in front of it you’ll find a nice viewing point with some benches where you can sit down. It’s beautifully peaceful! BONUS TIP: The entire train ride from Lauterbrunnen up to Wengen (or vice versa) offers great views as well. If you are coming from Lauterbrunnen, make sure you sit on the right side to make the most of the views. If you are coming from Wengen down to Lauterbrunnen, then sit on the left. I unfortunately didn’t get to visit this viewpoint because during the morning of my explorations, the flow of Stabbauch Falls was comically weak, so there was barely any waterfall to see! I decided to opt out and by the time the sun came out and the waterfall flow returned to normal, it was time for me to board my train. That said, one of the most unique experiences you can have in Lauterbrunnen view-wise is hiking up to the Stabbauch Falls from town and enjoying the viewing platform that’s behind the waterfall. How to reach this Lauterbrunnen viewpoint: Starting from the Lauterbrunnen Tourist Info Center (Stutzli 460), walk in the direction of Staubbach Falls (away from the Train Station). You can’t miss it since it’s the focal point of the city 😉 Continuing on the main path, you’ll eventually reach a barn-like structure (pictured below) that says “Stabbauch Falls”. There will be signs here pointing you towards the trail. Don’t forget a water bottle – there’s apparently a little area where you can fill up with water straight from the waterfall! Last but not least: just walk up! 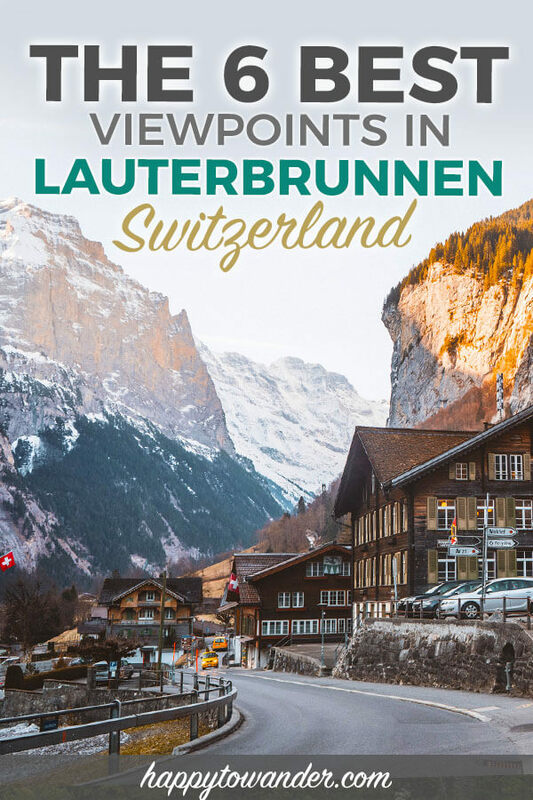 Did I miss any of your favourite Lauterbrunnen viewpoints? I didn’t spend nearly as much time as I would have liked in the Lauterbrunnen Valley! I know there are plenty of stunning views I probably missed, so let me know in the comments if you know of any that I should add! You mentioned that a lot of photos on the internet were taken by drones. I saw that almost the entire Jungfrau region (except the Grindelwald/First area) is a drone no fly zone, particularly Lauterbrunnen due to the helipad, i think. Did you notice many people flying drones while you were there? I didn’t see any drones while I was there actually! it’s possible many of those photos were taken before drone laws were implemented/enforced… or just taken by rule-breakers haha!